We see a lot of zombie films popping up these days, and that’s a good thing. While I can’t lay claim to being a fan of the zombie on paper, I can freely admit that I still get a big kick out of the undead on film. The latest zombie flick to come shambling our way is It Stains the Sand Red, and it looks mighty fine, as you’ll see in the first trailer (attached below). Colin Minihan directs and co-writes with Stuart Ortiz. The film stars Brittany Allen, Juan Riedinger, Merwin Mondesir, and Kristopher Higgins. It Stains the Sand Red is expected to hit limited theaters and digital platforms later this Summer courtesy of Dark Sky Films. 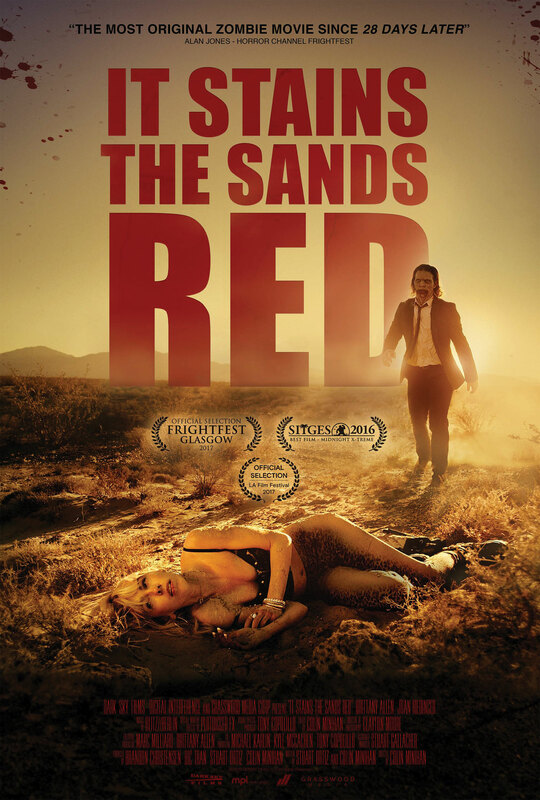 It Stains the Sands Red begins following a zombie apocalypse, when Molly (Brittany Allen) finds herself lost in the desert with one of the rabid living dead hot on her trail. Although at first she finds it hard to give him the slip, the situation gets even more complicated when the girl realizes that, unlike her, her pursuer has no physical need to stop and rest.